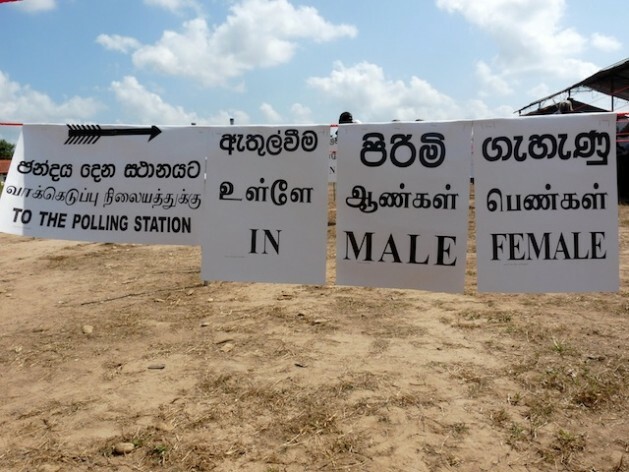 COLOMBO, Jan 6 2015 (IPS) - As 14.5 million Sri Lankans prepare to select their next leader, there is growing fear that violence could mar the Jan. 8 elections, billed as the closest electoral contest in the island’s history. Election monitors were worried that as incumbent President Mahinda Rajapaksa and his rival Maithripala Sirisena wound down their campaigns on Jan. 5, violence would scare off voters. Keerthi Tennakoon, executive director of the national election monitoring body Campaign for Free and Fair Elections (CaFFE), observed that a worrying precedent has been set by police who have by and large remained inactive against violations of election laws, especially those perpetrated by government supporters including at least two parliamentarians. “The police always appear to be late on the uptake when decisive action by law enforcement can be the most effective deterrent [to violence],” he told IPS. He pointed to recent clashes in Kahawatta, a town in the central Ratnapura District, as an example. In the early hours of the morning on Jan. 5, while a group of opposition supporters were busy setting up the stage for a rally by common opposition candidate Sirisena in the town’s public grounds, a band of government supporters arrived in eight vehicles and began attacking them. Rather than running away, the opposition group retaliated. The situation escalated, and shots were fired. Three opposition supporters were injured, and one was rushed to the hospital in critical condition. Enraged, the opposition supporters launched a retaliatory attack on election offices set up by government followers. The main roads of the town were blocked for at least four hours while the mayhem unfolded. “Police [did not] take any action until two hours after the initial incident,” CaFFE noted in an update. “They only reacted when the [opposition] United National Party (UNP) supporters started attacking [Deputy Minister Premalal] Jayasekara’s offices,” the monitoring body added. A couple of hours earlier, another group of government supporters loyal to a deputy minister assaulted officials from the election commissioner’s department in the eastern town of Trincomalee after they had gone to investigate a digital screen in a public space relaying election propaganda. The attack took place despite the officials being provided security by nine policemen. “The last 48 hours before the election are crucial; ordinary voters will not want to risk being assaulted, or worse, if they feel that there is such a risk,” Tennakoon said. The elections have been billed as one of closet in recent history. President Rajapaksa, who called elections two years before they were due, is facing a stiff challenge in the form of his one-time health minister Sirisena. The run-up to the election has been dominated by personal attacks against the top contenders, and has remained largely empty of policy discussions. Despite robust growth, Sri Lanka still faces vast economic disparities. The richest 20 percent of the population enjoys half of all national income, while the poorest 20 percent has access to just five percent of the country’s wealth. According to the latest Household Income Survey by the government’s Department of Census and Statistics, the monthly income of the poorest 20 percent of the population was 10, 245 rupees (about 78 dollars), while the richest 20 percent earned a monthly income of 121,368 rupees (about 933 dollars). Furthermore, the war-ravaged North is mired in poverty despite the civil war ending in May 2009. Anushka Wijesinha, an economist and policy advisor, observed that the election manifestos are full of promises relating to public spending and low on strategic policies that would ensure long-term stability. “Unsurprisingly, both manifestos are populist and full of public spending goodies – from welfare handouts to public sector salary hikes. These will boost short-term consumption, and are unlikely to be inflationary as recent inflation has been low. But the spending will hurt the fiscal consolidation efforts of the past few years and public finances may come under increased pressure,” he said. The elections are likely to create economic uncertainty at least in the short term and will in all likelihood be followed by parliamentary elections. A day after elections were announced on Nov. 20, the Colombo Stock Market recorded its worst slide in over 15 months, and has remained sluggish ever since. “Both [leading candidates] have a heavy emphasis on state-led initiatives and taxpayer-funded programmes, which in the past have been notoriously inefficient. Instead, focus of policies should be on making it easier for private sector entrepreneurship and innovation to thrive,” Wijesinha asserted. The election has also seen a crumbling of the broad-based support President Rajapaksa enjoyed in Sri Lanka’s parliament since the war’s end. Since late 2010, the President has had a two-thirds majority in the 225-member parliament. But a little over a month after elections were called on Nov. 20, 26 members from the government’s camp have crossed over to the opposition. The Sirisena campaign has also gained the support of parties representing Muslim and Tamil minorities, who together comprise some 15 percent of the country’s population of 21 million. There has been some attention paid to issues of importance to the minorities, especially development in the Northern Province. President Rajapaksa campaigned in the North twice and pledged to revitalise the economy and create jobs. Still, the unemployment rate in the Northern Province is stubbornly high at 5.2 percent, well above the national rate of 4.4 percent and the third highest in the country. The island’s highest unemployment rate of 7.9 percent was recorded in the Kilinochchi District last year, according to government statistics. Poverty is also rampant in the North, with four of the five districts that make up the province registering rates higher than the national poverty rate of 6.7 percent. But Muttukrishna Sarvananthan, who heads the Point Pedro Institute of Development based in northern Jaffna, told IPS that if the Northern economy is to regain momentum, more private investment needed to be channeled in. “I would argue that more private capital investment that could generate a large number of [jobs] is the critical need, rather than foreign aid,” he said, pointing out that policies needed to be formulated with long-term stability in mind. He also feels that decentralising power could help address political as well as economic grievances. “Fiscal devolution to the provinces should be undertaken immediately to provide the necessary financial resources for the provinces (including the Eastern and Northern Provinces) to operate independently and effectively without interference from the national government,” he stated. Power devolution has been a critical demand of minority Tamil groups throughout the island’s post-independence history. In fact, the lack of political power was a major catalyst for the growth of separatism and the rise of the separatist Liberation Tigers of Tamil Eelam (LTTE), which waged a protracted battle for an independent ‘homeland’ for the Tamil people from 1983 until 2009. However, Ponnadurai Balasundarampillai, former Vice Chancellor of the Jaffna University, told IPS that power devolution would be a tricky subject for any administration. “If it is a new president, he will have to take stock of the situation. The incumbent presidency has already shown that it favours a more centralised form of governance and administration,” he said. We see all the symptoms of a badly failed state under the PTA. No surprise at all.